Pharmaceutical Name: Thallus Laminariae seu Eckloniae. Botanical Name: 1. Laminaria japonica Aresch. ; 2. Ecklonia kurome Okam. Common Name: Laminaria, Kelp, Kelp thallus, Kunbu sea cress. Part Used & Method for Pharmaceutical Preparations: The laminaria thallus is collected from the sea in summer or autumn. It is cleaned, cut into pieces and dried in the shade. Meridians: Liver, stomach and kidney. 2. To promote water metabolism. 1. Goiter manifested as enlarged neck and stifling sensation in the throat. 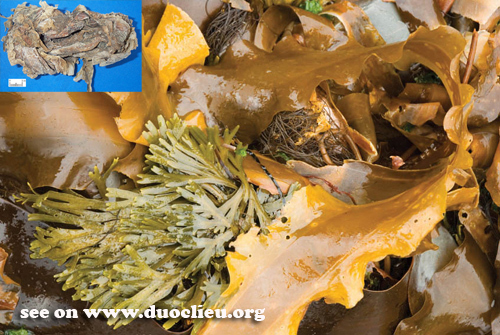 Laminaria (Kunbu) is used with Seaweed (Haizao) and Sea clam shell (Haigeqiao) in the formula Kunbu Wan. 2. Edema of the foot or general edema. Laminaria (Kunbu) is used with Poria (Fuling) and Alismatis rhizome (Zexie). Dosage: 10-15 g, decocted in water for an oral dose.